Taking the pain out of delivering the weekly spelling test - easy to use & builds a clear profile of pupil's spelling levels and progress. 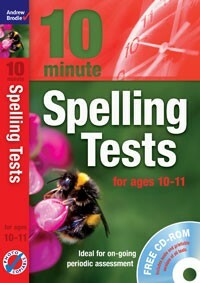 10 Minute Spelling Tests Ten Minute Spelling Tests for ages 10-11 (plus audio CD) By: Andrew Brodie Ten Minute Spelling Tests are easy to use and are designed to take some of the pain out of delivering spelling tests. Pupils are provided with a strip of ‘words of the week’ to learn, which in most cases would be given out as homework. The spelling test then takes the form of dictated sentences or paragraphs read aloud on the audio CD. This also helps with pupils understanding of words as they are set within a context. The pupil worksheets feature exactly the same sentences or paragraphs with gaps for the target words, which the pupils then fill in. All the target words are matched to the Primary Framework and ‘Letters and sounds’. Using the results of the tests, teachers can build a clear profile of the pupils’ spelling levels and in this way monitor progress. This ties in well with the current move towards Assessment for Learning and on-going assessment of pupils’ progress (APP).